So I’ve been thinking about hands and arms. I started by thinking of extremely small hands, on my hands. So here are some drawings from that thinking. 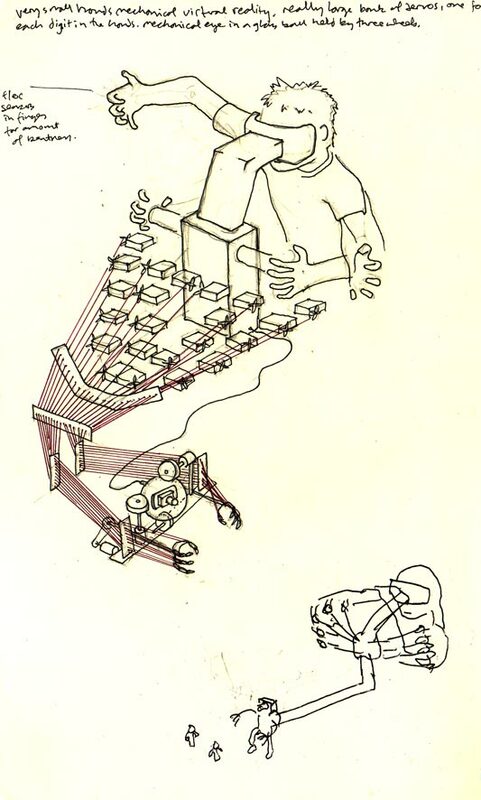 This drawing is of a toy that shrinks your hands down so you can play in a small world, with small figures. Your fingers are all connected up to a group of flex sensors, which converts the analogue movement to a cluster of servos. The servos collectively control fingers on the small hands by tightening or loosening. So the movements of your fingers become roughly and awkwardly analogous to those of the small hands in the toy. There is also a screen inside some goggles hooked up to a small camera in a glass ball between the two small arms. So when you look in to the goggles, you see what is in front of your arms. There are two wheels which you can twist to point the camera in different directions, like an eye. Kind of like an analogue version of virtual reality, only right in front of you and not virtual. I would also like to have a very small hand at the end of my finger. To pick up pens and things. You control the small hand on one finger using your other fingers, with flex sensors (same as above). You lose one of your big hands to gain a little hand on the end of one of your fingers. I came across Chad Thornton‘s work. He is at Google now, but he made a mechanical finger as part of his work at Carnegie Mellon Interaction Design programme (nice video here). The belt buckle, and rubberised keyboard make her rig seem really convincing, her trainers too, and how she locks into the unit. The cyborg fingers for typing in Ghost in the Shell are nice too. No doubt there are more. It makes me think of Robocop‘s gun hip too although slightly off topic. I like them, robot arms. I see them as a celebration of industrial process. I predict they will become a more widespread part of our lives. They are cheaper now (it appears that non-load bearing ones don’t require three phase power either) and since they are multi modal they can perform many tasks, in strange contexts. No doubt FDM or other fittings are/will be available, implications of that could be very large. Imagine a robot arm in your drive thr(o)u(gh), changing a tyre, and then printing out your happy meal. Our lives could become peppered with arrays of multi-buildy-arms. Robotlab (via Roger Ibars) are a German partnership who have used industrial robot arms to perform a DJ set. Witnessing the arms is as important as their role. I find them disconcertingly accurate, mechanised confidence in something typically so analogue and expert and careful. There is also something about their inflexibility, their inability to reach inside certain arcs, too close to themselves. I like the way they occasionally find a sync with each other, and at other times drift out. I think these guys have a business model set up around this, so I’m very interested to see how that develops.